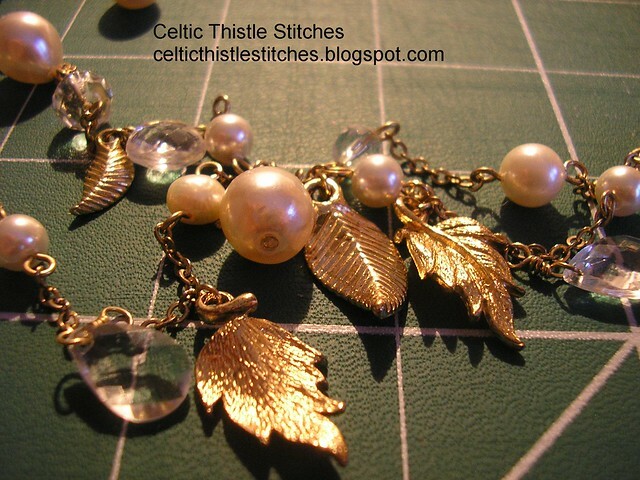 Celtic Thistle Stitches: New to Me in 2013 Link-up! This has been a month of several firsts for me already. The blog button above was one of my first New to Me experiences this month, and thanks Pam for helping me figure out how to make it work properly! My main New to Me in 2013 for January though is something that I signed up to do many months ago, but it has taken the extra nudge of the link party to actually make me go ahead and start. As many of you will know once you are signed up to the Craftsy website you will receive many notifications of sales and reductions on the classes they offer. It was in one of those too good to miss sales last summer that I signed up for the Wire-wrapped Stones, Crystals and Clusters class. The class outline introduced a number of tools that I did not already have so I set about building up an appropriate toolkit to start the first class. I bought the necklace above at a bric-a-brac stall as I was sure the stones and charms would come in handy one day! That is as far as I got - until now. Yesterday I printed out the class materials, gathered together my supplies and sat back to watch the class. Then I hit the first problem, wire for jewellery is graded differently in the US and Europe and as all of my supplies had been purchased in Latvia, they bore absolutely no relation to the grades mentioned in the class or in the materials list. A quick search of the internet and a print out of a wire gauge conversion chart and I was again ready to go. Now I am not saying that it was all entirely straightforward, the lengths of wire now sitting in my rubbish bin will testify to that. but I do now have a pair of wire-wrapped circle and bead earrings handmade by me! In fact I have two pairs! So that is my New to Me for 2013 now it is time to catch up with all things New to You! As ever please link back to this post in your post and/or add the blog button to your sidebar and check out the other links and leave a comment along the way. The emphasis of this link party is to celebrate the trying of something new, whether it works out exactly as planned or not, so a little encouragement here and there would not go amiss! Well done for working it through! I love making jewellery, but all the tools are so expensive! I did a silversmithing class at a local college and had to stop after the first term, because I *knew* I loved it and would want to take it further, but there was no way I could set up the torches etc at home. Oh, those are great! Good for you for making 2013 the year to try lots of new things! This link up is a great idea and comes at a 'steep learning curve' time for me - as we have just moved to a 5 acre property. I will try for 12 'new to me' things this year - not sure if jewellery making will be among them but you have done a great job. I like that you are reusing the beads. Wow! Aren't you the multi-talented gal!I just love the look of your jewellery! Cool jewelry! :) I am currently in the middle of my first quilt using diamonds. grr. ;) I will link my most recent post about it. It's funny how we often need a nudge to do things we really want to do anyway. Well done on learning how to and finishing not one, but two pairs of earrings. I've been tempted to sign up to Craftsy, but have so far resisted. Stippling is new to me. I'm learning free motion quilting and I've been avoiding stippling like the plague. Frankly, unless it is on a very small scale I think it looks terrible, but in this case it had to be on a small scale, and nothing else made sense so I bit the bullet and tried to do it. And it wasn't great, but not too bad. 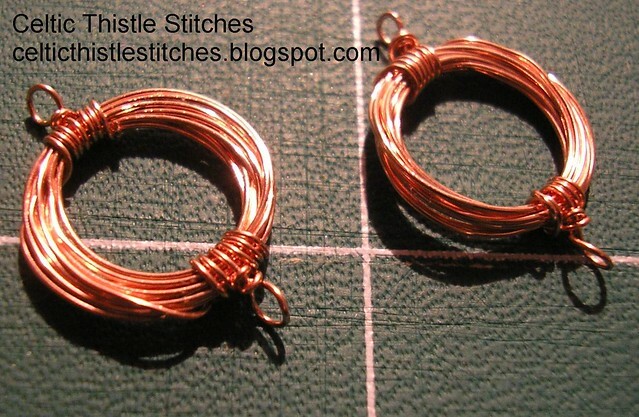 Great earrings and your wire wrapping looks very neat to me. One additional new thing is trying to fix the no reply blogger status that I've got. I've tried something else and maybe, just maybe, it is now working. Love those earrings - well done! This idea is great. I'm doing a bit of catching up, the bom quilt looks fab, sounds like a great day in London, and I love the earrings, thanks for the reminder about shoes! I love your earrings and what a fun NEW link up! 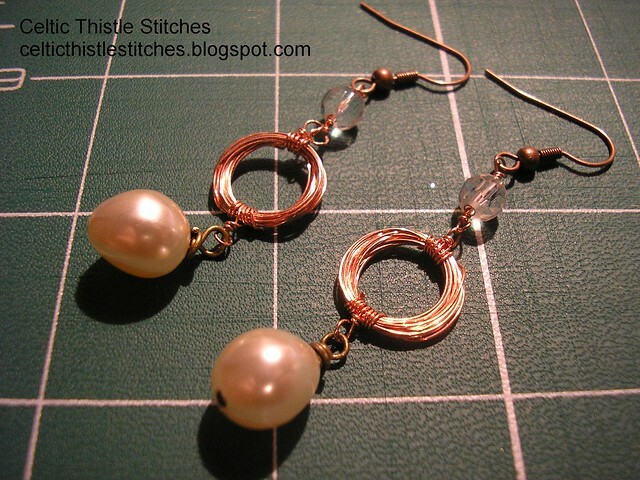 Your earrings a lovely you are quite talented making jewelry.Great job improvising tools. Such tenacity! Good work, the earrings are darling! This will help me to try new things. I have a few on a list. Such a great idea for a link up - it's so interesting reading the different posts! Hope to link up next time.